A) Do you carry ammunition? Yes, we stock all kinds of ammunition for a variety of firearms. Don't see what you need? Let us know! B) Are you familiar with Benelli firearms? Yes, Wendl's Weapons is an authorized dealer of Benelli products. C) Do you do gun cleaning? Gun cleaning starts at $25.00 and can increase depending on the condition of the gun. Muzzleloaders start at $50.00 and can increase depending on condition. D) Do you offer a discount for military or law enforcement? Yes, Wendl's Weapons is proud to offer a 5% discount to military, law enforcement, fire personnel, EMTs, and other First Responders, with valid credentials on firearms and 10% on accessories and ammunition. F) Is Wendl's Weapons an FFL dealer? Yes, we have a Federal Firearm License and can help you with the transfer of your firearm. G) Does Wendl's Weapons offer gunsmithing? Yes, gunsmithing costs depend on the type of work performed. We do most minor types of gunsmithing – please call for details. G) Can I get a gift certificate for Wendl's Weapons? Yes, we offer gift certificates in any amount. I) Do you get new inventory regularly? Yes, we list our inventory here every Monday morning (Holiday's excluded) but you should call us for an update of new stock at 712-775-2338 or check out our Facebook Page. L) Does Wendl's Weapons offer layaway? Our no-hassle layaway only requires 25% down and you get 3 months to pay! M) Can I get my scope mounted at Wendl's Weapons? Scope mounting is FREE if either the scope or the gun is purchased from Wendl’s Weapons. N) Are you a member of the NRA? Yes, we are proud members of the National Rifle Association (NRA)! P) How can I pay for my purchases at Wendl's Weapons? We accept money orders, cashier's checks, Visa, and MasterCard. T) Can you help me with a gun transfer? Need to transfer ownership of a gun? We can help. Gun transfers are $25.00. T) What are some common terms I should know in relation to gun ownership and gun safety? Check out our Glossary of Terms for more words and phrases. 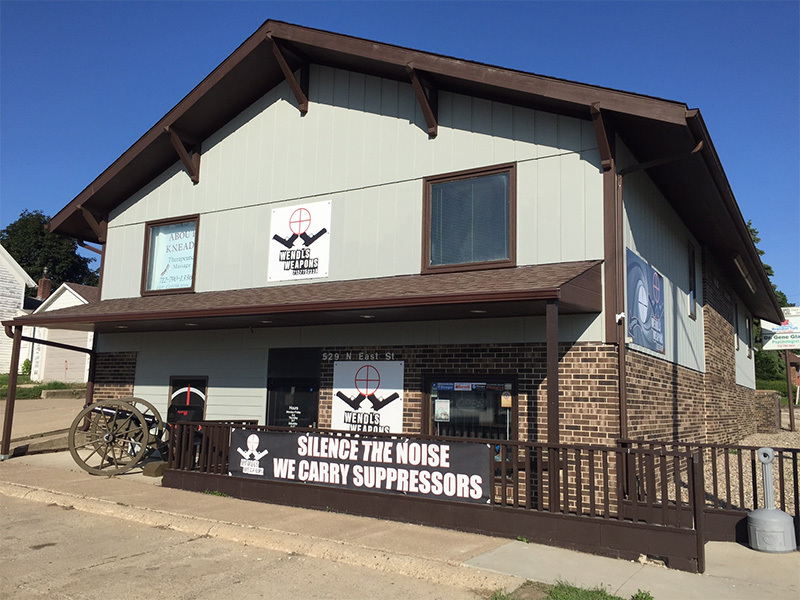 U) Can I buy or sell used firearms at Wendl's Weapons? We are happy to talk to you about selling, buying. or trading firearms. Stop in or give us a call to learn more. V) Do you handle Vortex or Volquartsen products? Yes, we are proud to be authorized dealers for both companies.